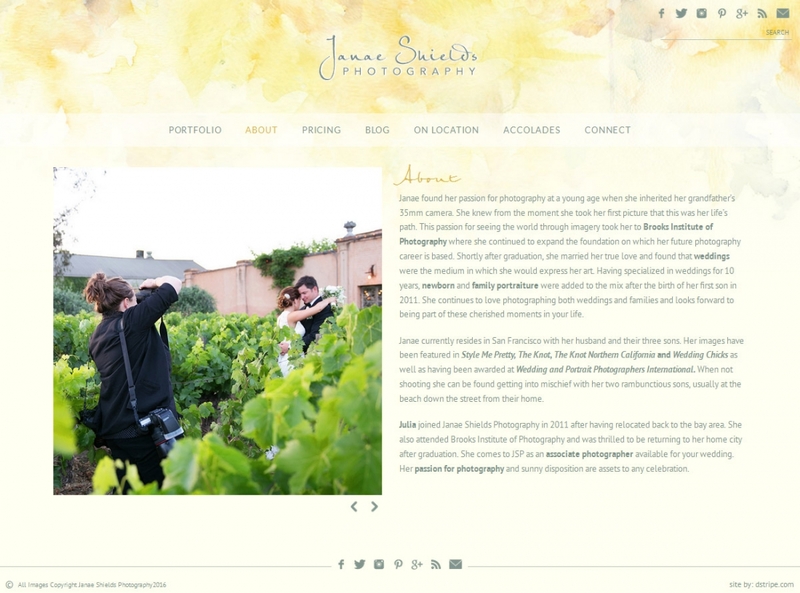 True story: we started redesigning Janae’s site in a light green and somehow through the process changed to yellow… So happy we did, the watercolor at the top adds just a touch of interest while not distracting from Janae’s amazing photography. 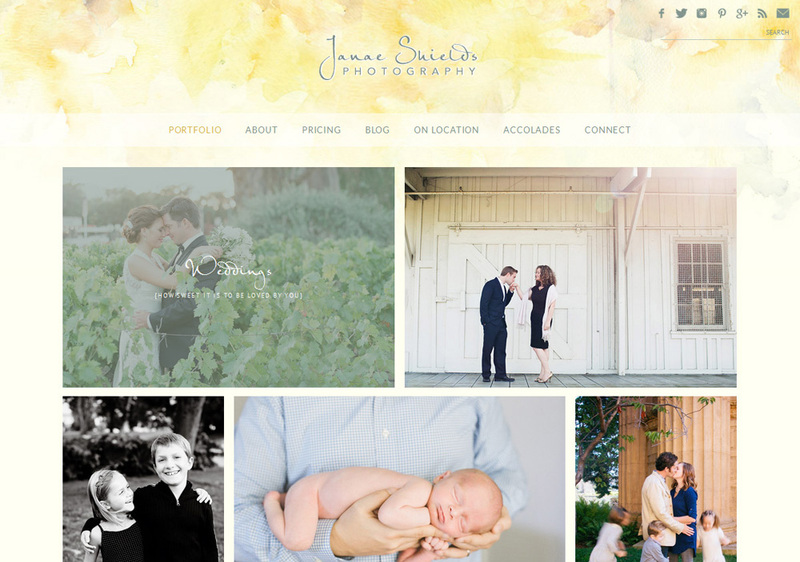 Her home page opens to all of her portfolio galleries. Why not just get straight into her stunning work? Her accolades page is impressive with press & testimonials mixed together on one page. Blog galleries have a custom backend where she can easily drag a folder of images in and rearrange by thumbnail instead of working in that tiny post editor window. On the frontend, each blog post is a gallery that is fully functional within the page. Clicking on a thumb will show the image right there. No popups! Social media, social media, social media! 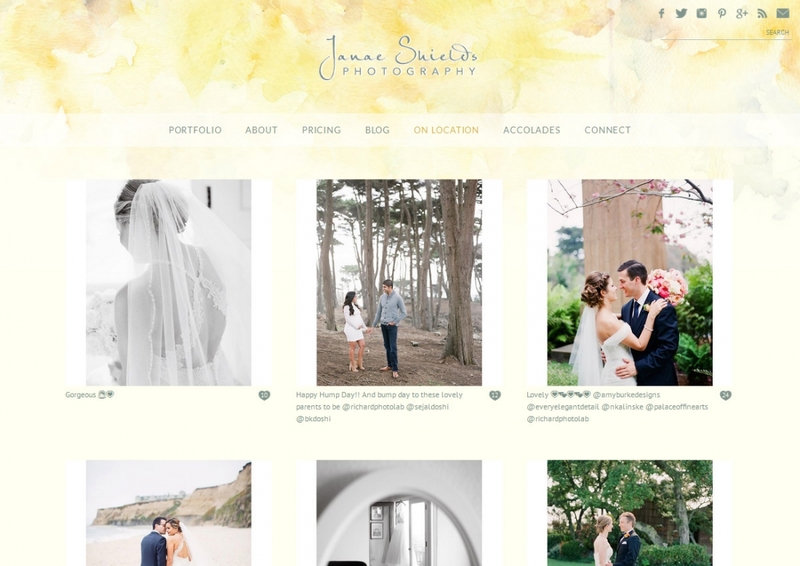 Pinterest links on each image, both in the portfolio and the blog… Share blog posts on ANY platform you want … Janae’s current instagram feed is on its own page…. The bottom of her contact page shows the most recent from facebook, instagram, pinterest and twitter. My website has been instrumental in generating new business and attracting the clientele I want. 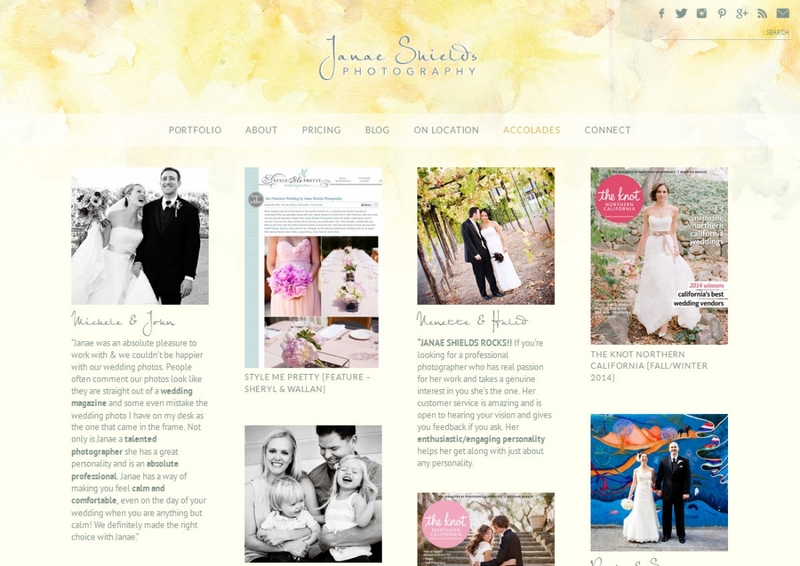 The wedding photography industry is flooded with “template” websites; I wanted the exact opposite of that. 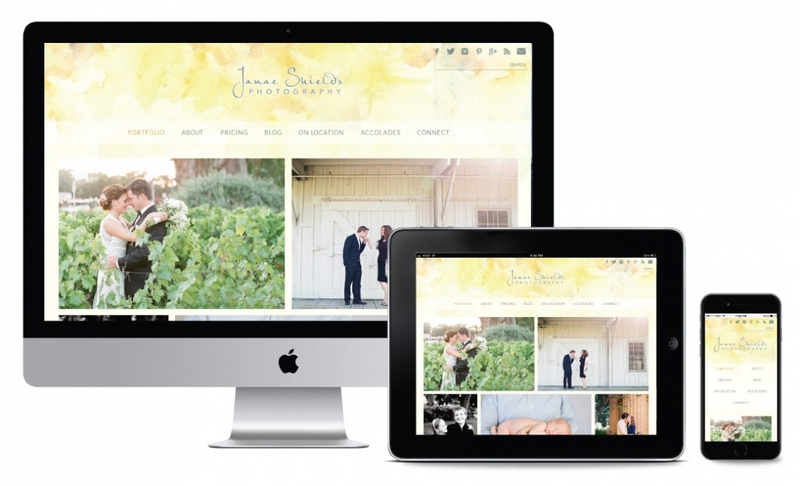 Having a custom designed website reflecting me and my business has allowed me to stand apart from a saturated market. 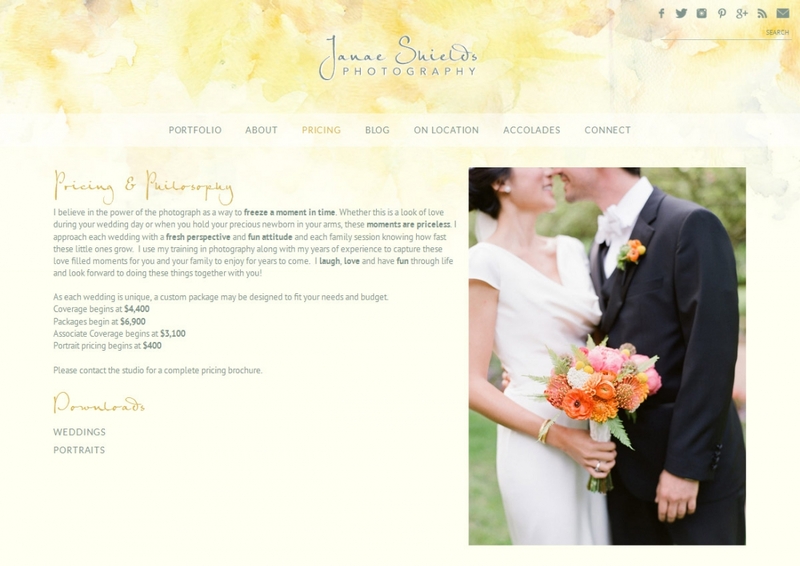 Clients appreciate the unique design that first greets them when opening my website. As the first thing most clients see when they encounter my company, I wanted it to be eye catching and immediately leave a good impression. My website is an extension of all of my marketing materials and through Deb’s expert design they all flow well as a consistent brand. Working with Deb was a treat. 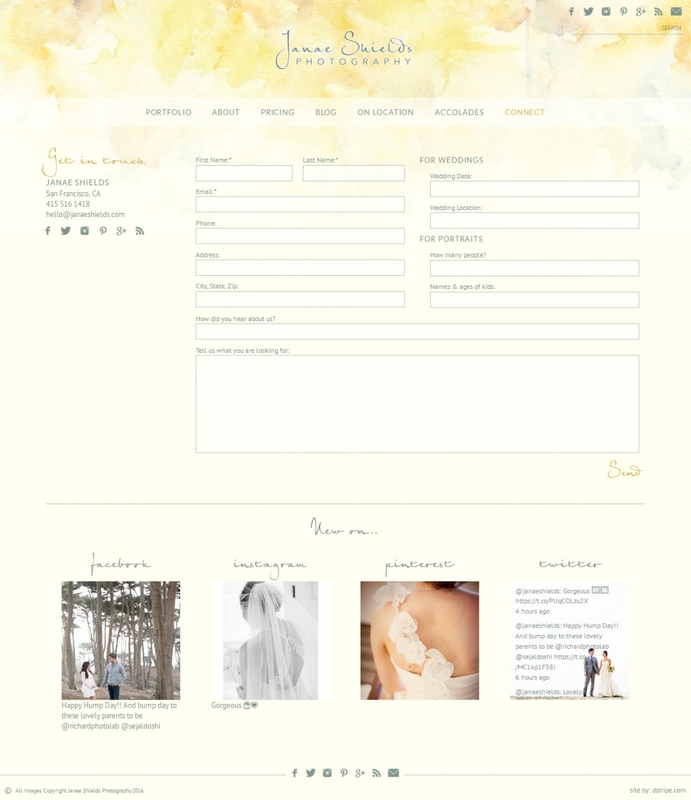 She did an amazing job of taking my rambling thoughts and turning them into the website I wanted. I still don’t know exactly how she did it! She did a great job of giving me realistic timelines and gave me the proper expectations of how the process would work. I trusted her throughout the process to design a website that is a true reflection of me and my company and she did that in every sense. I wholeheartedly recommend Deb!